Current library hours are 1:00 p.m. to 4:00.p.m., Tuesday through Friday. The library is also open 1:00 p.m. to 4:00.p.m. on the second Sunday of each month. A vital part of the Society’s mission is to make historical information about Dauphin County available to the public. Our research facilities are located behind the Mansion in the Society Office. In addition to our library research room, we maintain an archives that has been growing in size for over 130 years and includes more than a million photographs. If you plan on spending more than a day or two doing research, please consider becoming a member of the Society. Members can conduct on-site, self-directed research without paying an admission fee to use the library. If you would like staff to conduct research for you, please see our fee schedule. The library (including archives research) is open Tuesday through Friday and the second Sunday of the month from 1:00 p.m. to 4:00 p.m. with a few exceptions, so call ahead at (717) 233-3462 to confirm hours the day you want to come. To make the best use of your time, we recommend you contact the librarian to see what resources are available for your topic and, if possible, to let us know what day you expect to visit. Please contact the librarian at (717) 233-3462 or email library@dauphincountyhistory.org. 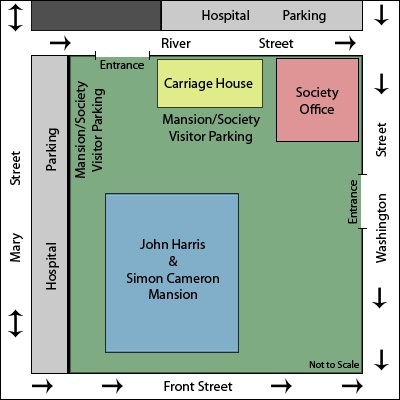 Free parking is available behind the mansion. Please note: No child under 12 will be admitted to the library even if accompanied by an adult. Special exceptions may be made for children who are working on a school research project. Such arrangements must be made in advance of your visit.